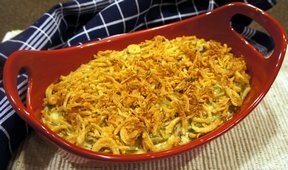 No need to mess with a good thing when the original green bean casserole is perfect without adding anything else to it. This is a must around our house with mashed potatoes. 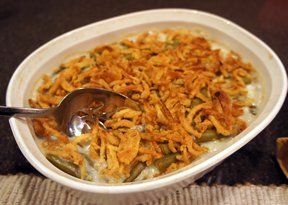 Combine green beans, soup, milk, pepper and 1/2 of the onions; gently stir together to mix well. Spread mixture in a 1 1/2 to 2 quart ovenproof casserole dish. Bake at 350° F for 25 minutes. 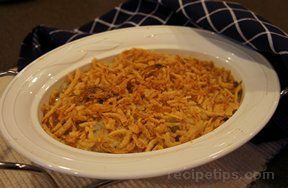 Top with remaining onions. Bake 5 minutes more. 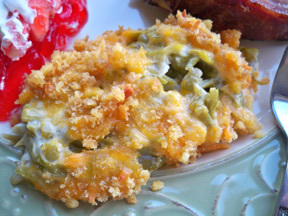 NOTE: You may substitute 18 ounces frozen cut green beans, thawed and drained. "A little too much milk for my taste; I like it thicker. Good flavor though."